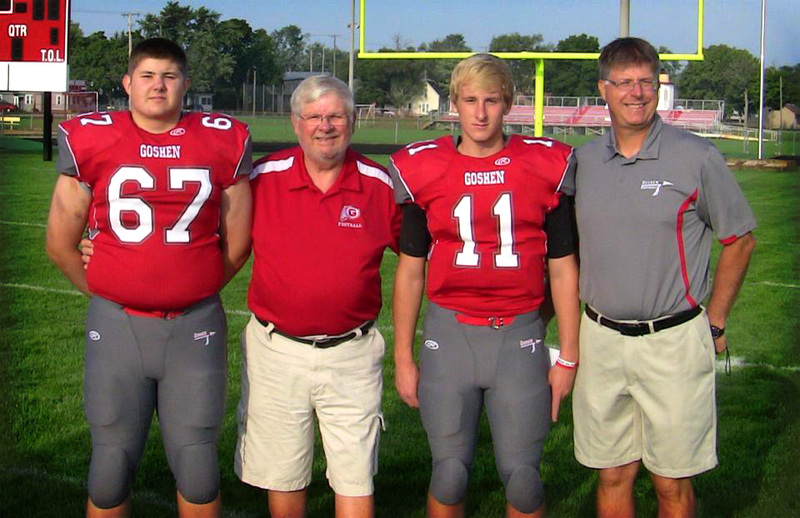 Good of Goshen story submitted by Mike Biller, Assistant Football Coach, Goshen High School. 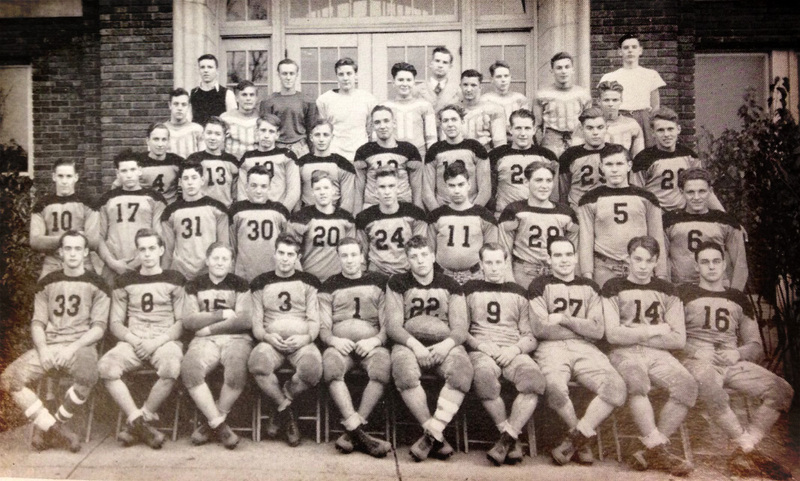 Zuke Biller is #22 in the first row holding the football. He was team captain 1937, 1938. The Biller name goes back in Goshen High School football close to eighty years. It all started in the 1930’s with Lowell “Zuke” Biller. Lowell got his nickname from his teammates because they said he hit like a bazooka. Zuke was a 3 year starter in the offensive and defensive lines for Hall of Fame coach Herman Byers. In 1937 Zuke was selected all state along with being named team captain by his teammates. After his playing days as an adult, Zuke would drive the team bus for the Redskin away games. The next generation of Biller to play on Foreman Field was Zuke’s son Larry. Larry was a 3 year letterman and 2 year starter at GHS for Hall of Fame coach Don Yoder. Larry started at Defensive End on the 1959 team that went 8-1 with a highlight being the Redskin’s win over arch rival Elkhart High. Larry is a former high school football official and has spent the last 40 years as a member of the chain gang at home football games on Foreman Field. Derek will be named one of the team captains for this 2014 football season, 76 years after his great grandfather had the same honor. The 3rd generation of Biller to play at GHS was Larry’s sons Mike, and Don who both played for Hall of Fame Coach Ken Mirer. Mike was 2 year letterman and starting quarterback on the 1982 team. A highlight for Mike was being on the 1981 team that finished 13-1 and was state runners up. Don was a starting guard on the 1984 and 85 teams where he made 2nd team all Northern Lakes Conference. Mike is starting his 30th season as an assistant football coach at Goshen High School. He is currently the Head Freshmen Coach and was on the coaching staffs of the 1988 state championship team and 1999 state runners up team. The current generation is represented by Mike’s step son Derek DeMeyer and his son Jacob Biller. This fall will be Derek’s third season leading the Redskin team as their starting varsity quarterback. Known as “The Chief” by his teammates because of his leadership, Derek has worked very hard in preparing for his final season playing for GHS. Jacob will be the starting center for the Redskin J.V. team. Both boys are playing for new head coach Kyle Park. Jacob will be wearing the number 67 which is the same number his uncle Don wore in his playing days. Needless to say it will be an exciting and special fall for the Biller Family. Each home game will have 3 generations involved playing, coaching, or supporting the Redskin Team. A tradition all started years ago by Grandpa Zuke.